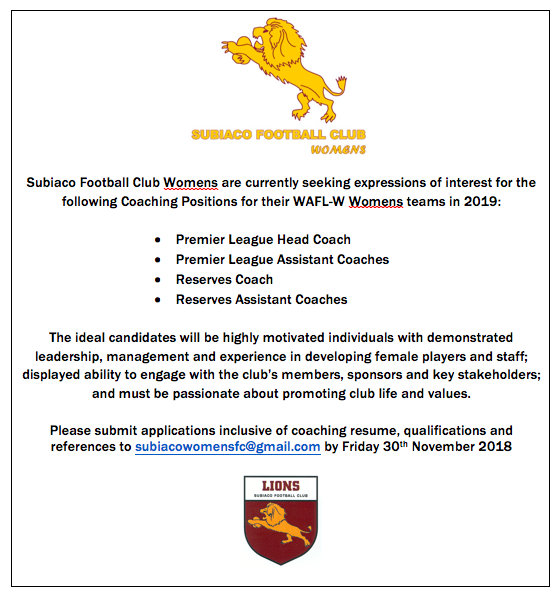 The Subiaco Football Club Women's team has outstanding coaching opportunities for suitably qualified coaches for the 2019 season. A proud club, with a history of sustained success, the Subiaco Football Club Women's formerly Coastal Titans have won seven premierships in the past 15 years. Most recently the Subiaco Football Club Women's played off in the 2018 WAWFL Grand Final. This represents an outstanding opportunity for prospective coaches to further their career by being involved with a leader in the way of Women's football within the WA Football landscape. Further information can be found and applications can be submitted via email subiacowomensfc@gmail.com.